FilmLA, a non-profit organization and the official film office of the city and county of Los Angeles that works to streamline and enhance on-location filmmaking process for communities and content creators, has reported the year 2018 as the second strongest year for on-location filming in Greater Los Angeles. According to the report released on January 16, 2019, L.A. rose 5.0 percent in the fourth quarter of 2018, a strong finish of a year in which local film production came close to record highs. Filmmakers logged 10,539 Shoot Days (SD) in the fourth quarter, and 38,795 SD for all of last year. Reasons for the 1.3 percent year-over-year annual increase includes double digit increases in Feature Film (12.2 percent), TV Drama (10.6 percent) and TV Pilot (15.2 percent) production, plus a very strong showing for Commercials (8.7 percent). Incentivized projects brought to Los Angeles by the California Film & Television Tax Credit Program contributed 11.4 percent, or 146 of the 1,078 SD in the Feature category for the quarter. Incentivized Features filming in Los Angeles during the fourth quarter included Birdbox, Once Upon a Time in Hollywood and Rim of the World. The Features category finished the year up 12.2 percent, to 4,377 SD. Although the Television category lost a little ground in the fourth quarter (slipping 0.3 percent to 3,795 SD), TV Reality production (up 21.2 percent to 1,052 SD) and TV Dramas (up 9.0 percent to 1,489 SD) both staged late-year rallies. Across the entire year, Television’s strongest performers were TV Dramas (up 10.6 percent to 4,848 SD) and TV Pilots (up 15.2 percent to 508 SD). On-location Commercial production continued its upward rise in the fourth quarter, increasing 5.5 percent (to 1,404 SD). 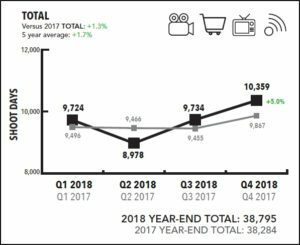 The Commercials category finished the year 8.7 percent ahead of 2017, with 6,033 SD in total. If you are interested in learning more about the percent rates, or which Feature Films or TV shows were apart of L.A.’s rise in on-location filming for this past year, please visit www.filmla.com.